Christmas may be over but that's not an excuse to settle for beans on toast or prawn cocktail. Snacks or starters, it's worth trying something a little more exciting and even more tasty. So this weekend, if you want a different 'starter' for a family meal or just a toasted snack, then try one of these. 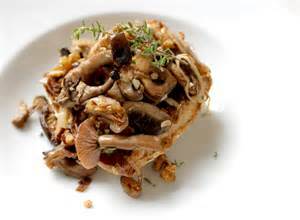 Fry a mix of sliced cultivated and torn wild mushrooms in butter with fresh chopped thyme and salt until the mushrooms soften and start to brown. Stir in some crushed garlic and cook for a minute more. Add a squeeze of lemon juice and then pile onto toast with the buttery juices. garnish with fresh rosemary and serve. Mix horseradish sauce with creme fraiche and a squeeze of lemon juice. Neatly slice an avocado and arrange on toast. Ripple slices of smoked salmon on top and add a dollop of horseradish cream. Sprinkle with finely chopped red onion, scatter with dill and serve. 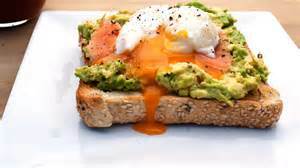 Why not add a poached egg on top! Drizzle a little extra virgin olive oil over the toast. 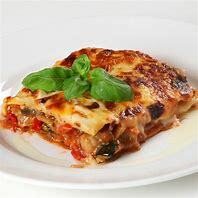 Spread thickly with a good soft, rindless goat's cheese, and then transfer to plates. Arrange thin slices of pear or apple on top, brushed with lemon juice to keep them from browning, then season with salt an pepper and add a splash more olive oil. Scatter over a few pomegranate seeds and serve.